LAS VEGAS (AP) — LeBron James, Kobe Bryant and three other Olympic gold medalists were already back. Add a defensive stopper, a potent scorer off the bench, and one of the NBA’s most explosive athletes, and the U.S. is certain it has a powerful Olympic basketball team. Better even than the one that won gold four years ago. The Americans rounded out their roster Saturday, adding Blake Griffin, Andre Iguodala and James Harden to the nine players who already seemed secure long before training camp began. They earned the final three spots that opened after a rash of injuries knocked out at least four players who would have been on the team. They beat out Eric Gordon, Rudy Gay and No. 1 draft pick Anthony Davis of New Orleans, who couldn’t scrimmage this week because of a sprained ankle. Also heading to London for the defending gold medalists are: Chris Paul, Deron Williams, Kevin Durant, Russell Westbrook, Tyson Chandler and Kevin Love. The Americans never had a close game four years ago until the championship game, when they pulled away in the final two minutes to beat Spain 118-107. Even with Dwight Howard, Dwyane Wade and Chris Bosh unable to return from that team, the Americans think this one can be even stronger. USA Basketball Jerry Colangelo acknowledged the adversity the team faced with all the injuries in his remarks before the players were introduced during a press conference, all wearing their white USA jerseys — James and Anthony even looking game-ready in white headbands. “But as the dust settles, I’m proud to say that we’ve put together in my opinion a terrific team with great athleticism and great versatility and we believe we’re going to be successful,” Colangelo said. Griffin showed he was healthy again after being slowed by a knee injury during the playoffs, putting on an impressive dunking display following practice Saturday. Harden, the NBA’s Sixth Man of the Year with Oklahoma City, gives the Americans more scoring punch off the bench, and Iguodala is a defensive specialist who can guard multiple positions. The Americans lost Howard, Derrick Rose, Wade and Bosh to injuries in recent months, forcing them to scrap plans to name their 12-man roster on June 18. They asked the US Olympic Committee for a roster extension and added Harden and Davis to their original pool of finalists chosen in January. Harden seemed a long shot, joining Griffin as the only player who didn’t play on either of the last two U.S. teams. But the Americans felt they needed someone comfortable with coming off the bench more than they did Gay, who was behind too many other forwards on the depth chart, and the result was three players from the Oklahoma City Thunder. Colangelo was intrigued by Davis’ skills, but the national player of the year at Kentucky sprained his ankle last week and was not able to take part this week, robbing him of a chance to show he was ready to handle international competition now. Iguodala was frequently assigned the role of shutting down the opponent's best player two years ago in the world basketball championship, and he previously had scrimmaged against the U.S. on the select team of young players, so Colangelo and coach Mike Krzyzewski knew what he could do. James, Bryant, Anthony, Paul and Williams were all part of the 2008 Olympic gold medalists. 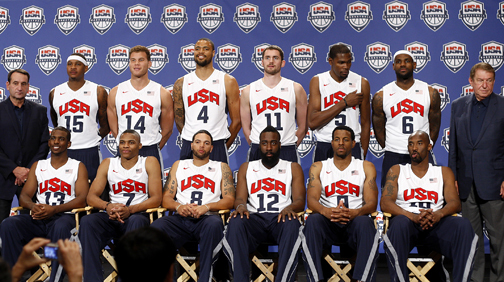 Durant, Westbrook, Chandler and Love also played on the world championship team two years ago. The injuries leave the Americans short-handed at center, where Howard started four years ago in Beijing and Bosh backed him up. Chandler is the only natural center left, so the Americans will be forced to use some players out of their normal NBA positions. But what remains is still the most athletic team in the world, with potent scorers at nearly every spot, and the Americans will look to overcome any size disadvantage by punishing teams in transition. Griffin said expects to be strictly at the center spot. The Americans opened training camp Friday and will practice here through next Wednesday, then play an exhibition game against the Dominican Republic on Thursday. The players who were not selected will be alternates who could be replacements in case of further injuries up until 48 hours before the July 27 start of the Olympics. Davis will stick around just in case, playing on the select team. James and Anthony will be playing in their third Olympics for a U.S. team with an average age is 26.1 years. The young guys, combined with the veteran returnees, could make for a golden mixture.